I hear many people joke about their fat dogs. My grandmother had fat, sausage shaped beagles that she fed from her plate at dinner. Sorry grandma, but I just don’t think it’s a laughing matter to have an overweight canine. The truth is, if your dog is packing on extra pounds, you could be taking years off his or her life. Every pet parent knows that the only thing we don’t like about our dogs, is their shorter- than-human life spans. Being obese or “a bit pudgy,” puts extra strain on the heart and lungs, the joints, every part of a dog’s body. 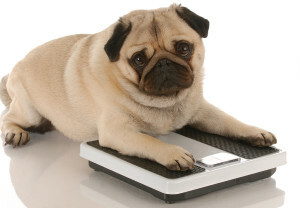 Your vet says your dog needs to lose some pounds. How do you help your pet shed the weight? Just as with humans, the answer is healthy eating habits and regular exercise. Ultimately your dog will eat what you give or what you allow them to have. They will also follow your lead when it comes to exercise, because they want to be with you, and perhaps they enjoy the great outdoors, too! 1. Reduce your dog’s food portions. You dish it out every day. Dish out a little less. If you go to the vet and your 40 lb dog is 10 lbs overweight, you need to cut food intake by 25%. It may sound like a lot but I don’t think your dog will notice the difference – mine didn’t. Stay with me. If you are feeding this dog 2 cups of food split up into two meals of a cup each, you simply change each meal to ¾ of a cup rather than 1 cup of food. That doesn’t seem so bad, does it? You can also reduce intake gradually to ease the adjustment, say an 1/8 of a cup in this situation. Measuring is the key to success, no matter how small the reduction. 2. Know the correct amount to feed your dog for your dog’s optimum weight. Finding out the correct food amount to maintain a healthy, vet-recommended weight for your dog is not as easy as it seems. I haven’t found the guidelines on bags of dog food very helpful to me; use them as a guideline or starting point only, don’t take them as gospel. Weigh your dog at regular intervals to see how you are doing. Adjust food amounts down or up accordingly until you have the right amount. I feed significantly less than the recommended amount for our dog’s food, but their weight is just right for them. 3. Take your dog for walks, to the dog park or schedule regular doggie play dates with other dogs. If your dog loves to fetch, throw that ball or frisbee for your furry friend to get him running. If you ramp up your dog’s exercise regimen, you may not need to reduce the food as much. More exercise is good for you and your dog – it’s a win-win situation! If you have a tiny dog, please resist the temptation to carry him everywhere. Dogs need the mental stimulation of the smells and sights they experience from walking on their own four paws, plus they need the exercise! 4. Change to low calorie or smaller treats. We give our large dogs very small treats so we can give them more often and not worry about the calories. 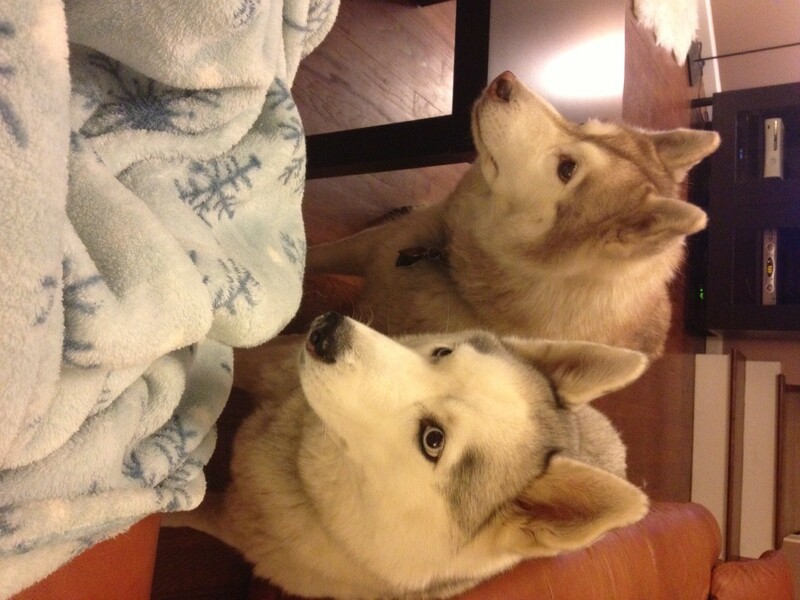 I love giving treats – that adoring look in my dog’s eyes is so addictive! I can give snacks freely when they are very small ones. 5. Try pet safe, healthy treats like raw carrots, blueberries or even apple slices with peanut butter (not too much peanut butter – it packs on extra calories). 6. Weigh your dog every week or two to gauge your results until you have a formula you are comfortable with for your dog. Adjust food intake and exercise according to your dog’s progress. How the heck do you weigh your dog? If your dog is small enough to pick up, this is easily done at home. Get on your bathroom scale and find out your weight. Then weigh yourself while holding your dog. Subtract your weight from the weight of yourself with the dog, and the difference is your dog’s weight. If you cannot weigh your dog at home, drop by your vet’s office. They usually don’t mind you borrowing their scale for a healthy weigh in! Remember if you ever get frustrated during the doggie weight loss process, that achieving a healthy weight for your dog is just one way you can ensure a long and happy life for your beloved canine. You’ll see beautiful results in a healthier, younger-looking dog, with greater energy and mobility. Once you get the right regimen of food and exercise in place for your dog’s unique needs, it’s easy to maintain this healthy lifestyle. Learn to ignore those adorable, come hither looks which say “feed me more”. Spoil your dog rotten with love, pets, walks and low calorie treats, not table scraps or extra kibble! I am fascinated by the pack dynamics among my dogs. 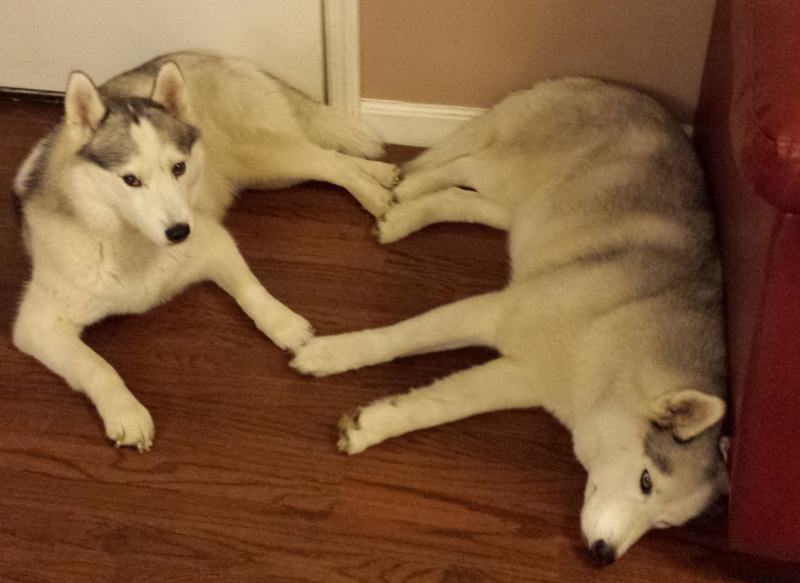 If your dogs don’t get along very well at first, don’t despair. In the canine world, the subtleties of the pack order sort themselves out over time. 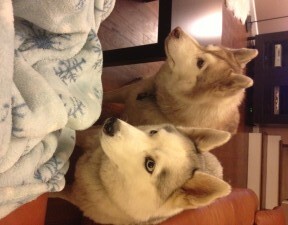 I have three Siberian huskies – I’ve seen my share of small dramas! We’ve had Fiona since she was a small puppy of eight weeks old. When Fiona was three years old, we took in my father’s dog Shelby. They’d known each other since Fiona was born and she was like a mother to Fiona. They got along famously. Feeding time with Fiona and Shelby was easy. We would fill the dog food bowls with kibble and they would eat an appropriate amount among themselves over time; we would simply fill the bowls when they were empty. Amazingly, the two dogs were the perfect, healthy weight all the time. They appeared to be self-regulating in their diet. A few years later, our sweet Shelby dog became sick and died. Poor Fiona fell into a depression without her friend and companion. She would barely eat. She moped around the house. She was grieving and she was lonely. After about four months, we decided to “get a puppy” for Fiona. We contacted the husky breeder where we adopted her and were told they had a two and half year old dog who needed a home. Her previous owner had died recently. The dog’s name was Secret, a female, and she was not house trained, not spayed, and in heat. Wowee, we did not know what we were in for! 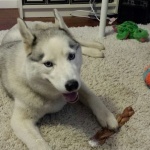 When we brought Fiona to meet Secret, Fiona tried to get her to play and woo woo-ed at her in typical husky fashion, jumping at her energetically, grabbing her ruff, wagging her tail. Secret took this as not friendly, and growled and snarled at Fiona. We drove home, a seven hour drive, with two dogs making an uncertain peace in the back seat of the car. I wasn’t sure it would work out. My husband, always confident in the power of dogs to work things out among themselves, was sure it would. Once we got home, the saga continued. Secret was in heat and grouchy, peeing everywhere. Fiona knew that this was bad dog behavior and would bark at Secret to get her to stop. Secret again took this as aggression and growled and snarled back. Secret acquired a habit of grabbing Fiona by the base of her tail which would pin Fiona down and not allow her to free herself. We crated Secret when we were not home, more for Fiona’s protection than to save our floor and furniture. Secret, in typical husky fashion, soon learned to escape the crate and we gave up on crate training her. With my heart in my throat, I left Secret uncrated and headed off to work. When I came home, both dogs were fine. No bloodshed. No house damage. No severed tails. Fiona, however, was hiding down the end of the hallway and refused to play with her toys or join the family. It seemed that Secret liked stealing away every toy that Fiona grabbed. Secret also would still drag Fiona around by her long, luxurious tail. Secret is a voracious eater and we could not leave food down unattended as she would eat it all. Fiona was not used to eating like this and I had to entice her to eat in one sitting in the morning and one at night. She continued to lose weight. With persistence and creativity, we got both dogs to eat healthy amounts of food in two separate meals a day. I weighed them every two weeks or so to see how the feeding schedule was doing, to make sure the amount they were getting was on target. With time and patience, we wooed Fiona from her hiding spot at the end of the hallway, to join us and Secret in the living room. Now Fiona plays with her toys, eats heartily and spends time with the family. But I think she resented the newcomer for a while. Secret wasn’t nice – at first – and she wasn’t Shelby. Now Fiona and Secret still have their battles, but they do occasionally lie together and do cute things like make hearts of their joined paws!